Following reports of military action in Ankara and Istanbul, Turkey's Prime Minister Binali Yildirim said Friday a group within the Turkish military was involved in an attempted coup, the Associated Press has reported. Hours after military jets were seen flying over Turkey's capital and major bridges were closed in Istanbul, the Turkish Miltary released a statement saying it had taken over, according to reports from Reuters and the Telegraph. "The power in the country has been seized in its entirety," said a military statement read on NTV television, according to the Telegraph. The official website for the Turkish Armed Forces was not immediately accessible. Turkey's prime minister, however, denied reports military forces had fully seized control in comments aired on NTV. Although Yildirim acknowledged a coup attempt was in progress, he stressed the elected government remained in power. "There was an illegal act by a group within the military that was acting out of the chain of military command," the AP reported he said. "Our people should know that we will not allow any activity that would harm democracy. There are certain groups who took the arms trusted to them by the state and pointed them toward state employees. We shall determine soon who they are. Our security forces have acted against these groups." 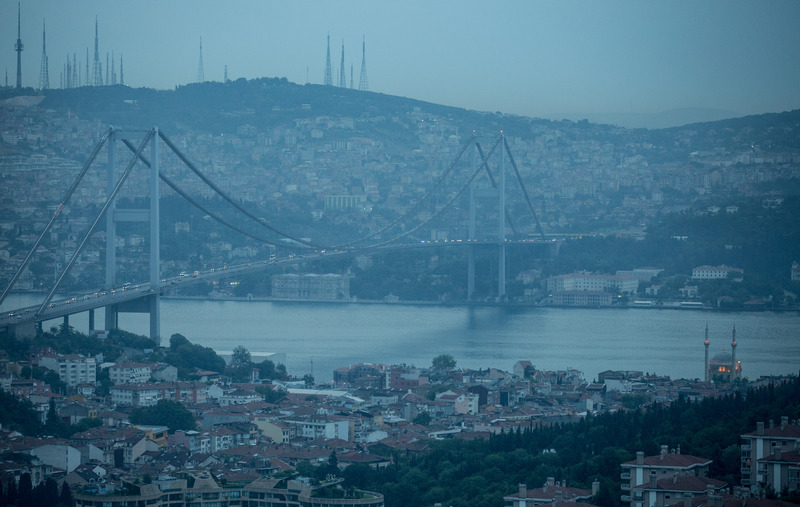 According to reports from locals, tourists, and journalists on Twitter, gendarme soldiers shut down both the Bosphorus Bridge and Fatih Sultan Mehmet Bridge in Istanbul, while military tanks were spotted outside Istanbul's Ataturk International Airport and in neighborhoods throughout the European and Asian sides of the city. All flights have reportedly been canceled. Reuters reported military jets were seen flying over the nation's capital Ankara. A nationwide curfew was reportedly announced along with martial law in a statement read at the order of military on state broadcaster TRT, according to the Guardian. A spokesman for Turkish President Recep Tayyip Erdogan refuted claims the government had lost control of the country in a statement released after the military claimed to be in power. "Turkey's democratically elected president and government are in power. We will not tolerate attempts to undermine our democracy," the Guardian reported the statement said. Erdogan, who was in an undisclosed location at the time of the attempted coup, said the attempt would not be successful and called for Turkish citizens to take to the streets in support of democracy in an unconventional Skype address televised on CNN Turk.